Who was Si Zigler? Simeon S. Zigler, 1911-1969, was my father. He came to the United States from the Ukraine with his family at around the age of 12 in 1922-23. He wanted to be an artist and attended night classes at the Cincinnati Art Academy in the late 1920s. He worked after leaving school at the age of 16 in a Catholic publishing house in Cincinnati where he learned his English setting type. The Great Depression caused him like many of his generation to change plans and he gave up his art for many years after marrying my mother, Rose, and then having three sons. But, in the mid 1950s, Si decided he would like to paint again and he took up watercolor. Over the next several years, he worked at this and developed some very nice paintings. Some of these were encouraged by my mother's desire to have some "Jewish Art" hanging on the walls of her living and dining rooms. 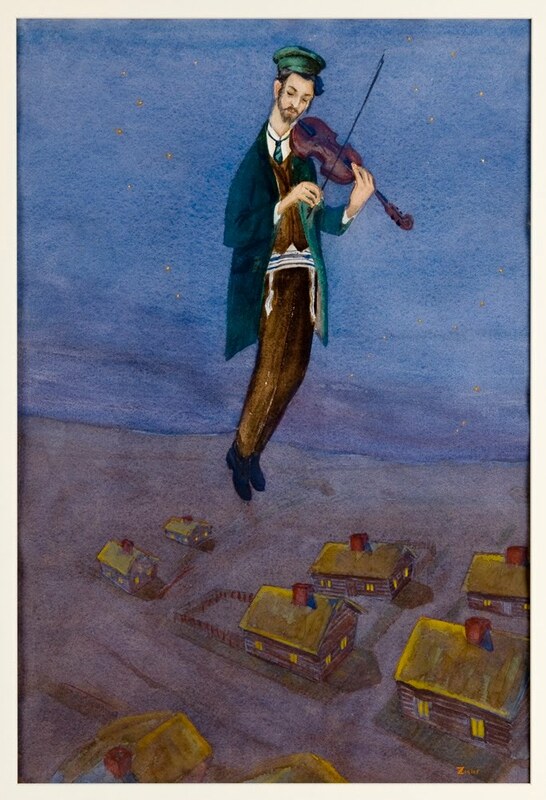 The Fiddler is one such piece. It was inspired by the play Fiddler on The Roof, and the fact that Si grew up in his early years in that part of the world where this story took place - the Ukraine. I hope you enjoy this piece and feel free to leave your comments. Si always liked to hear comments about his paintings. That's where you get your talent from! Love this work and I enjoyed reading about your father.